Whether you prefer a pool with special features or a pool with simple elegance, Crystal Clear Signature Pools of Pennsylvania is here to help. The usual time to complete a project is approximately 2 months. Our Designer (Bruno Morganheira) and Owner (Vince Piscitelli) like to personally come to your home to talk about the visions you have for your new pool and backyard experience. They come to your home to take pictures of your backyard and discuss the options you have and price according to your budget. After meeting with you, either Bruno or Vince will be in touch to invite you to visit our show room for a final presentation for the full experience. If you like the designs and contract we can begin the process. 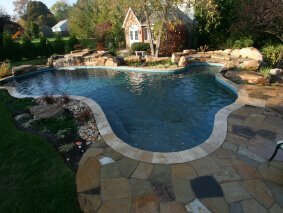 Every custom pool design and build project Crystal Clear Signature Pools takes on has a different style. Therefore, we need to be flexible for our customer's wants and needs. No pool we build is the same and we are proud of that! Whether you're looking for simple elegance or out of the ordinary, here at Crystal Clear Signature Pools we can guarantee it all. 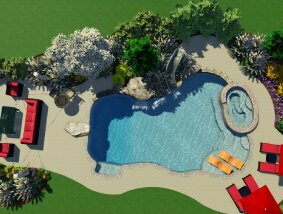 Setup a consultation with our custom pool builders and designers to discuss your vision. We provide our custom pool building services throughout Montgomery, Bucks, Mercer, Hunterdon, Burlington, Burks, Chester, Delaware & Philadelphia Counties. 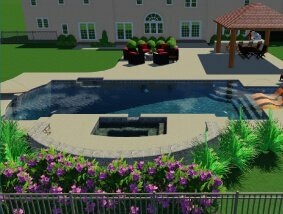 By selecting this designing choice you will be able to not only envision your pool but see what it would look like in your back yard! Selecting this designing method will allow you to see positioning and dimensions that sketches cannot show you. Seeing the pool in this way can help with making sure it's the design that you will love for years to come. Crystal Clear Signature Pools LLC construction practice exceeds industry standards. To learn more about how Crystal Clear Signature Pools is different, call to set up a consultation to meet with our Designer (Bruno Morganheira).